BisQuit (bacterial image-sequence quantification interactive tool) is a semi-automated interactive analysis tool designed in particular for time-lapse biomicroscopy image sequences. It integrates different image processing tools into an efficient pipeline for the tracking and segmentation of sequences featuring elongated objects such as rod-shaped bacteria. The algorithmÃ­s main steps include image preprocessing, bacteria ridge tracing, tracking and finally segmentation. The tracing and tracking steps are interactive and therefore allow editing and automatic propagation of manual corrections. Several image-based measurements comprising among others metrics and pixels intensity, allow for instance the creation of phylogenetic trees and fluorescence analysis. 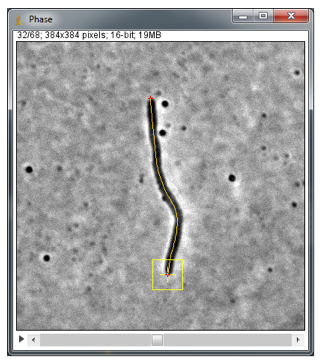 BisQuit was designed as a plugin for ImageJ and is therefore free and open-source.